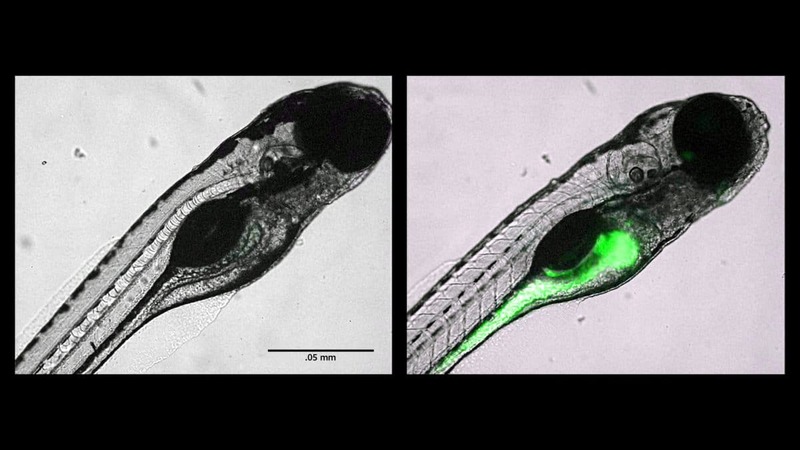 The image on the left shows a five-day-old Zebrafish larvae that hasn’t been exposed to nanoplastics. On the right, another five-day-old larvae is shown after it has been exposed to nanoplastic beads in the lab. The green fluorescence in the exposed larvae indicates that the plastics are in the heart, head, gall bladder, pancreas, liver, and gastrointestinal tract. Nanoplastics – plastic particles that are a thousand times smaller than the width of a human hair – are in the marine food chain. In the ocean, larger plastics like bottles and bags break down over time from physical and chemical weathering processes including sunlight penetration, wave action, and sand abrasion. This turns the plastics into microplastics – fragments that are less than five millimeters in size – and eventually into submicron-sized nanoplastics that drift imperceptibly around the ocean. That is, until fish find them. Nanoplastics may be invisible, but that doesn’t stop fish from eating them. But when they do, where do the particles go? Do they hang around the gastrointestinal tract, or do they branch out to other organs? These were questions MIT-WHOI joint program student Jordan Pitt tackled as an undergraduate at one of Duke University’s summer programs. In the lab, Pitt and her team incubated zebrafish embryos in small glass vials filled with seawater and droplets of fluorescent nanoplastics from a pre-made solution. The fish were exposed to the plastics for several days to determine where in their popcorn-sized bodies the particles would end up, and if there were any apparent health impacts. To Pitt’s surprise, the nanoplastics had no trouble getting through the protective membrane. As Pitt peered into a microscope, green fluorescence from the plastic beads could be seen in the yolk sacs of each embryo. From there, the nano-sized particles migrated to the gastrointestinal track, gallbladder, liver, pancreas, heart, and brain. The presence of plastics, according to Pitt, did not deform or kill the fish despite exposure during a critical life stage when “a lot of things are happening for the fish’s survival.” There was, however, evidence of lower heart rates and decreased fitness/swimming ability among some of the samples. Regardless, the work helps confirm reports from previous studies suggesting nanoplastics can migrate to different organs within fish. But for Pitt, it’s just the beginning. Working with toxicologist Mark Hahn and other scientists at WHOI, she’ll be building off her zebrafish research to shed light on other questions, such as how different plastics like polystyrene, polypropylene, and polyethylene may spread differently throughout fish, and if there are particular sizes of nanoplastics that don’t travel through organisms. According to Hahn, Pitt’s work intersects with one of the big science questions at WHOI: under what circumstances do nanoplastics cross cellular membranes and the blood-brain barrier. Ultimately, the goal is to better understand the concentration of nanoplastics in fish and other marine life, and be able to predict where these particles travel throughout an organism’s body. Given that many people eat seafood, there’s an important human health component to the research as well. 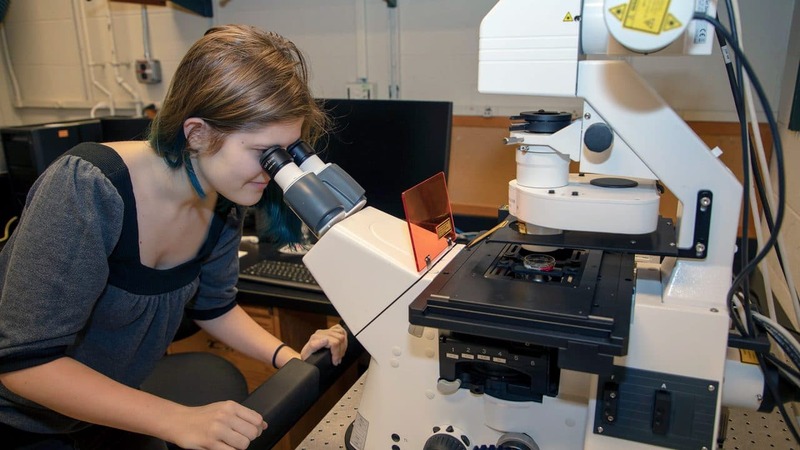 MIT-WHOI Joint Program student Jordan Pitt has been studying the impacts of nanoplastics – plastic particles that are a thousand times smaller than the width of a human hair – on marine life. In particular, she’s investigating where these particles travel throughout an organism’s body.